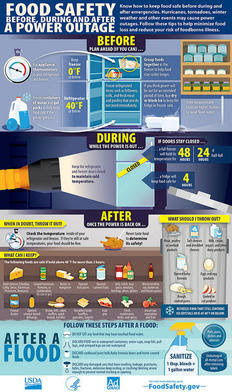 How long will food stored in the refrigerator be safe to eat during a power outage? Emergencies happen, especially with extreme weather conditions. When they do, the best strategy begins with an emergency plan. This includes knowing the proper food safety precautions to take before, during, and after a power outage. Minimize the potential loss of food and reduce the risk of foodborne illness by knowing how to determine food safety. You can learn the right decisions for keeping your family safe during an emergency with these food safety facts from the Food and Drug Administration. Know where to buy dry ice. Keep three days worth of ready-to-eat foods on hand that do not require cooking or cooling, which depend on electricity. A refrigerator keeps food cold for about four hours if it is unopened. A full freezer keeps the temperature for approximately 48 hours (24 hours if it is half full) if the door remains closed. Refrigerators should be kept at 40 F or below for proper food storage. If you keep an appliance thermometer in the freezer, check the temperature when the power comes back on. If the freezer thermometer reads 40 F or below, the food is safe and may be refrozen. If you do not keep a thermometer in the freezer, check each package of food to determine its safety. You can't rely on appearance or odor. If the food still contains ice crystals or is 40 F or below, it is safe to refreeze or cook. Refrigerated food should be safe as long as the power was out for no more than four hours. Keep the door closed as much as possible. Discard any perishable food (such as meat, poultry, fish, eggs or leftovers) that stays above 40 F for two hours or more. Inadequately refrigerated or frozen perishable food such as meat (like beef or pork), poultry (such as chicken or turkey), seafood, milk, and eggs may cause illness if consumed, even when thoroughly cooked. Begin preparing for power outages, severe weather and other emergencies now by joining the Prepareathon.